Linda Burton posting from Arkadelphia, Arkansas – Today is the first day of winter. And I was blessed with two good omens. 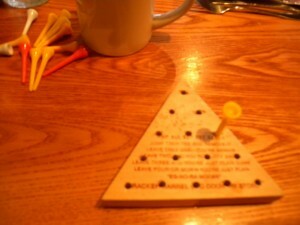 Have you ever tried to work one of those little Peg Puzzles that sit on every table in the Cracker Barrel? The goal is to end up with only one peg remaining, but it’s possible to back yourself into a corner and wind up with four pegs staring at you. Four! That means you are an ignoramus, on a level with pond scum. If you get it down to one however, you are a Certified Genius. Guess what. 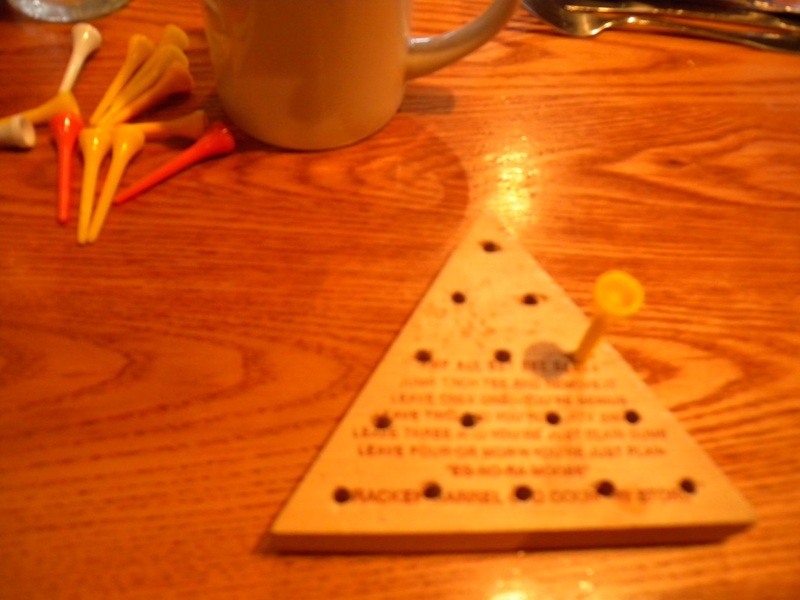 I got it down to ONE today, the first time ever in my life; I’ve tried to solve the darned thing in Cracker Barrels all across the land. I called my server over to see. “I take this as a positive sign,” I beamed. “This means I have made the right choice in moving to Arkadelphia. I’m a genius!” She gave me a high five and told me my biscuits were coming up. 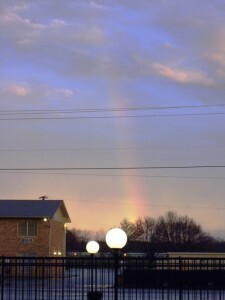 The other good omen was a rainbow, but that was later, after I’d spent the day exploring my new environs. We arrived in a storyteller’s cliché yesterday; it was a dark and stormy night. There was a thunderstorm of such fearful proportions I didn’t even unload the car, I just grabbed the cats and their basic stuff. We’d had a long drive across Mississippi past all those catfish farms and cotton fields, till finally we made it to the defining line that splits the country’s drainage system, that muddy old Mississippi River. 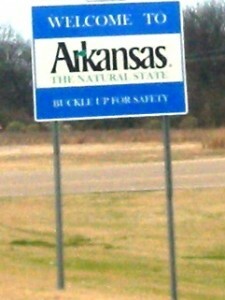 And then, at last, Arkansas. So much water in this state! We crossed Bayou Bartholomew, and then the Ouachita River. At El Dorado we left Hwy 82 and followed the river north. An eerie fog crept across the darkening fields, rising off the waters of the Little Missouri. By the time we hit I-30 the visibility plummeted to near zero. “Don’t let me mess up now,” I prayed to the rain gods, “we’re so close.” My guardian angel intervened, the Arkadelphia exit appeared, and that was that. The cats and I slept sprawled in a pile across the bed; exhausted, but no worries, no more long-distance driving to do. Here’s what the city’s website has to say about it. Situated among thick pine-covered hills and perched on a bluff overlooking the Ouachita River, Arkadelphia is a vibrant university town where good living is a way of life. Home to beautiful DeGray Lake State Park and two rivers – the Caddo and the Ouachita – Arkadelphia is an ideal destination for recreation or to establish residential roots. Arkadelphia is located at the foothills of the Ouachita Mountains in Clark County, Arkansas, and has a population of 10,714. 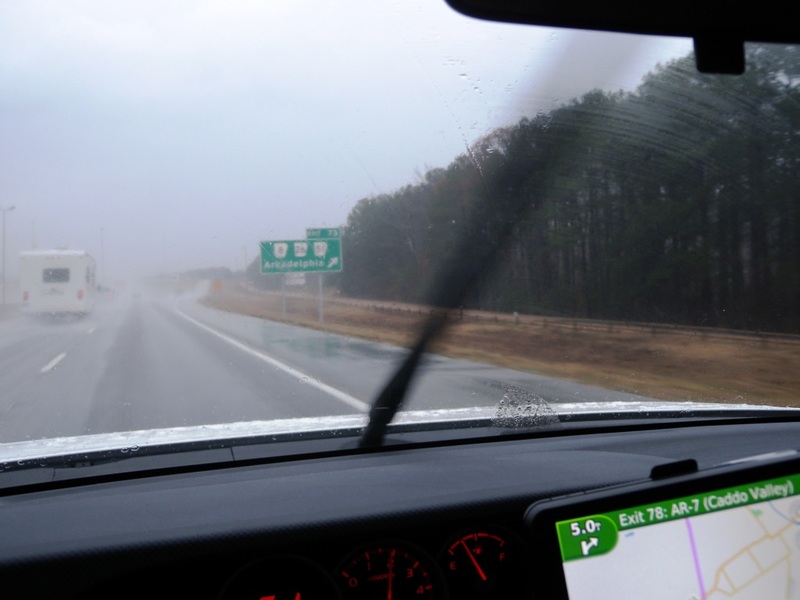 The community is located on Interstate 30 approximately halfway between Little Rock and Texarkana, and also on Highway 7 approximately 35 miles from Hot Springs. It is a three-hour drive to Memphis and four hours to Dallas. Arkadelphia’s location provides easy access to the amenities of larger cities while providing residents and visitors with the safety of a small town, as featured in “50 Fabulous Places to Raise Your Family: The Best Places to Live, Work, and Play,” Money Magazine. Arkadelphia’s scenic beauty, favorable climate, recreational and cultural amenities, and low cost of living make it an ideal place to retire. Baptist Health Medical Center provides a range of healthcare options, including LifeLine, a personal emergency response system for the handicapped and elderly. Residents of Clark County enjoy a favorable climate, with an average temperature of 43 degrees Fahrenheit in January and 82 degrees Fahrenheit in July. The cost of living index in Arkadelphia is 75.82 which means, when compared to the rest of the country, Arkadelphia’s cost of living is 24.18 percent lower than the US average. Recreational amenities abound in Clark County given its location at the foothills of the Ouachita Mountains and near DeGray Lake, which provides residents with opportunities for fishing, boating, canoeing, swimming, camping, hiking and picnicking. DeGray Lake State Park also includes a full-service marina and a public 18-hole golf course. Arkadelphia has a system of city parks which includes walking and jogging trails. Residents can also take advantage of the cultural opportunities provided by Arkadelphia’s two four-year universities, Henderson State University and Ouachita Baptist University, including theatrical productions, dance and music performances, art displays, and university lectures. Additionally, the universities’ sports teams offer football, baseball, tennis, and other sports at the Division II level.